When I came across this book on our last visit to the library,I just knew I had to borrow it. We already read The Penguin and a few of the Tilly and friends series. 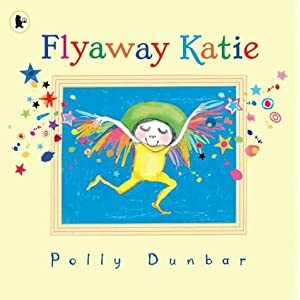 We love Polly Dunbar's books here. This book is about a little girl, Katie,who feels rather alone and grey. So to cheer herself up she puts on all her favorite bright clothes and paints herself bright colours, then the magic happens as she flies into the picture on her bedroom wall. A very simple yet captivating story with gorgeous illustrations. Also great for little ones who are learning the colours. I would love for you to share your books with us. Meggy, thank you for linking up. Thanks for telling me to come link up! I love checking out other books! What a great blog! Thanks for stopping by My Oatmeal Kisses! I'm excited to link up often! P.S do you have a button I could put on my site?? This book sounds great - thank you for joining WMCIR! That book sounds great! My girls would love it. I'm a little late... but I just linked up a book my two having been loving lately. Thanks for linking to 5-a-day! I shall be linking back to you this week and sharing the literature love!